Whether you’re in a big city or a small town, chances are you are seeing more bike lanes on your streets and more helmets on heads. For libraries, there are clear benefits for getting involved in the biking world including making libraries friendlier to existing biking patrons and bringing in new patrons through programs and outreach. 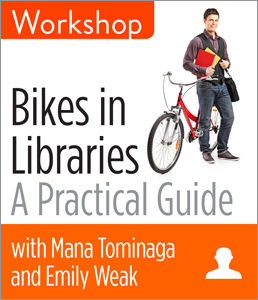 In this workshop, Mana Tominaga and Emily Weak of the Oakland Public Library—both avid cyclists—will show you how bikes can enhance your library’s participation in your community’s vision for health and sustainability and help forge strong local connections. You’ll come away from this workshop with practical strategies to make your library more bike friendly and more bike focused. Mana Tominaga has ten years of experience as a librarian and started at the Oakland Public Library (OPL) in June 2013. Prior, she worked for the San Jose Public Library, where she was on the selection committee for Silicon Valley Reads 2007-2009 and implemented programs at branches and online from 2010-2013. Her last role was as senior librarian with oversight of all digital services. Ms. Tominaga currently supervises the Main Library at OPL, which houses large collections of more than 350,000 reference and circulating non-fiction and fiction books. Ms. Tominaga is a passionate and experienced bicyclist and is married to a bike shop owner. Prior to librarianship, Ms. Tominaga was a technical writer and magazine editor and completed a book on FreeBSD. Emily Weak is currently an Adult Services librarian for the Oakland Public Library. Oakland is awesome. She previously worked as an Adult & Virtual Services Librarian at the City of Mountain View Public Library, where she developed a wide variety of programming such as the MVPL Seed Library, Silicon Valley Grows, the Library Bike Stop project, and the ESL Conversation Club. She is the founder of the blog Hiring Librarians. Prior to becoming a librarian, Ms. Weak was variously: a circus student, a cheesemonger, and a grocery store manager. Last May she biked more than 700 miles for the library in the Bike Month competition.